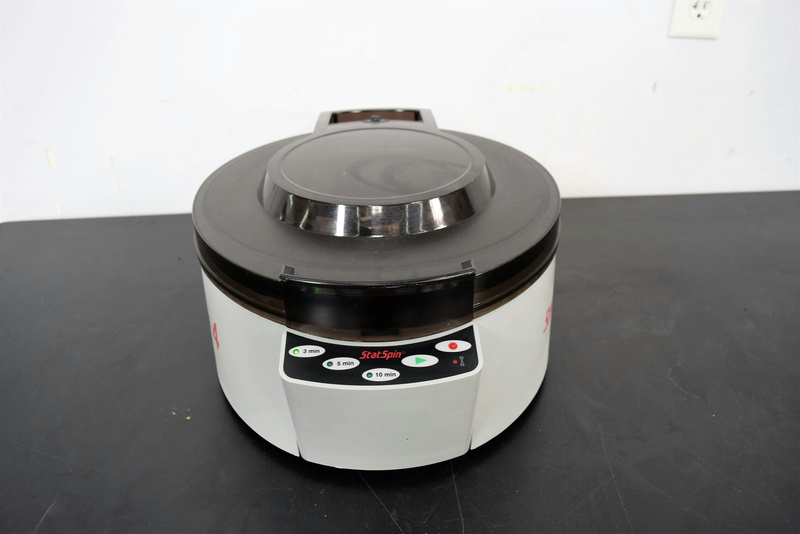 Iris Model M510 Stat-Spin Express 4 Centrifuge w/RTH8 Rotor & 8 Inserts . New Life Scientific, Inc. The StatSpin Express 4, high speed horizontal centrifuge provides faster turnaround time and greater productivity for your "lean" laboratory. Place it next to any STAT analyzer and serum or plasma gel tubes are ready in just minutes. With only three (3) settings, it is simple to use. Just select the 3, 5 or 10 minute button and press start. No fumbling with settings or the need to readjust the speed. For safety, the lid remains locked until the rotor comes to a complete stop. An audible alarm sounds when the cycle is completed. Samples can be processed as they arrive in the lab; no need for batching, no unproductive time spent waiting for the centrifuge.....you'll have results in minutes. Now you can process as many as eight (8) samples at once for high throughput. Our on-site technicians visually inspected and tested. They ran it for the 10 minute cycle which spins at 4500 rpm’s, the 3 and 5 minute cycles spun at 5100 rpm’s. No problems were found with this device.